ASOS launched in 2000 bringing cheap and chic clothing to the masses. The ASOS clothing collection is stacked with need-now pieces. Highlights include tongue in cheek T-shirts, this season's hottest skinny jeans and slogan jumpers. 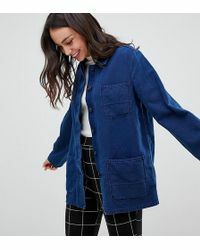 Each piece reflects the brand's enthusiasm for the latest trends featuring young, trendy and affordable designs for the twenty-something trendsetter. Update your current clothing collection with essential pieces and look stylish for less this season.